The Mira Alto Foundation and Project HEAL are joining forces to march together in PRIDE parades in 2019 in Boston, NYC, San Francisco and Seattle. 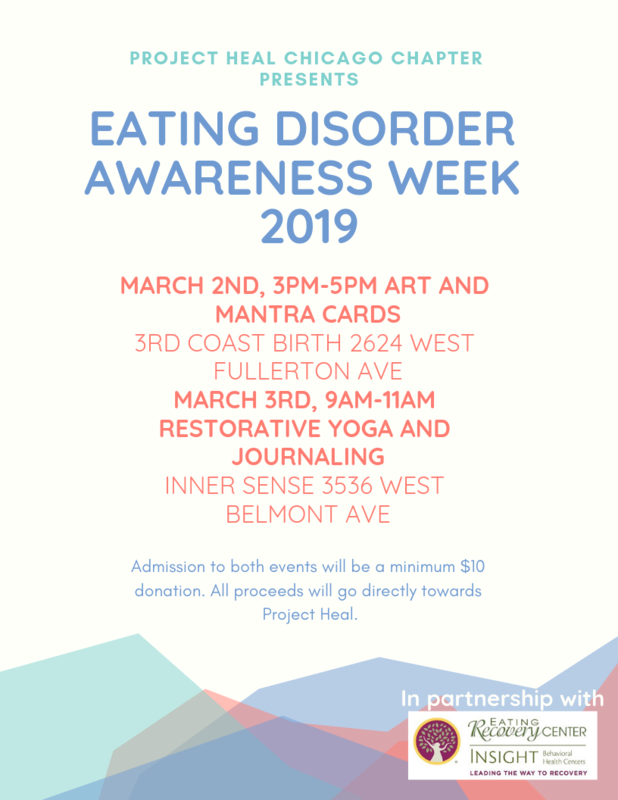 We are coming together to bring awareness to the need for access to affordable and quality eating disorder treatment and recovery support for the LGBTQ+ identified community. Join Project HEAL as we host a weekend camp getaway at a rustic camp in beautiful Southern California! Project HEAL's Denver Chapter invites you to our Great Gatsby Gala. We are excited to have Patrick Denney, a former NFL and CU football player living in recovery, as our speaker. Join us for a night of drinks, food, dancing, and advocacy. 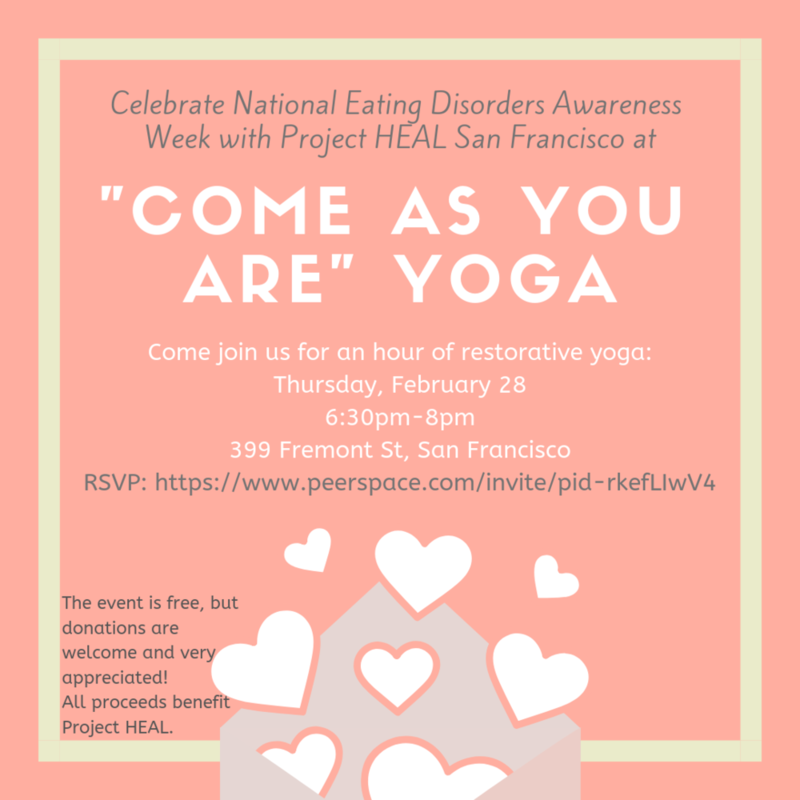 San Francisco chapter: "Come as You Are" Yoga! New Jersey: What's Your Story? JUST ANNOUNCED: Highland Park singer songwriter, DAVE HOWLAND will entertain us with stories using his acoustic guitar and great voice during intermission. The Ohio State University chapter: 4th Annual Gala! Help celebrate recovery and kick off National Eating Disorders Awareness Week by joining Project HEAL's Ohio State University chapter for our 4th Annual Gala on Saturday, February 23, 2019, at 7:00 PM in the Archie Griffin West Ballroom in the Ohio Union. Click here for more event and sponsorship information. Email Maggie Griffin (ohiostate@theprojectheal.org), Chapter Leader, with any questions. Our GOAL is to raise at least $300!! There is a $25 donation to attend this event. Please visit this page for more information and to make a donation. Hosted by the President of 49ers Enterprises and EVP of Football Operations, Paraag Marathe, Project HEAL's 10th Anniversary Gala will take place at Levi Stadium and includes a sit-down dinner, a program featuring Amanda Crew of the hit TV-show Silicon Valley, and a premier auction with impossible to purchase experiences. Join the Project HEAL-Eastern New Jersey Chapter for an evening centered around mindfulness. This event is open to all individuals working on their recovery from an eating disorder or sustaining recovery from an eating disorder. There is a suggested donation of $20.00 to attend this event. Laura Cipullo, founder of L’ifestyle Lounge will lead you through a gentle yoga experience that will flow into a mindful eating experience. Please bring food or a snack for this experience. Some snack items that tend to work well with Mindful eating experiences are crackers, M&M’s, and dried fruit. You are welcome to bring any type of snack you would like for this experience. On October 7. 2018 #HalfTheStory and Project HEAL are joining forces to host a “Pillow Talk” morning bash for Mental Health Awareness Day. The goal of the event is to gather members of the #HalfTheStory and Project HEAL Community to break down the stigma and create positive conversation around mental health and body positivity. Saratoga Spring chapter- 1st Annual Butterflies & Bowties Event! Join the Project HEAL-Saratoga Springs Chapter for our 1st Annual Butterflies and Bowties Eating Disorder Awareness Event on Friday, October 5th, 2018 from 7:00 PM to 10:00 PM at the National Museum of Dance in Saratoga Springs. This exciting event will feature fantastic speakers, cash bar, desert, live entertainment a silent auction. For more information about the event, reserve your tickets, and/or support this event please visit the event webpage, here. Boston chapter- Blaze Pizza Fundraiser! All proceeds benefit the Project HEAL Treatment Access Program. Blaze Pizza is donating a portion of their profits as a part of Project HEAL's second annual HEAL Week which will take place from Sunday, September 23rd through September 29th. With your support, we can make sure that local resources are available to support all of those throughout the Boston area who are affected by eating disorders. 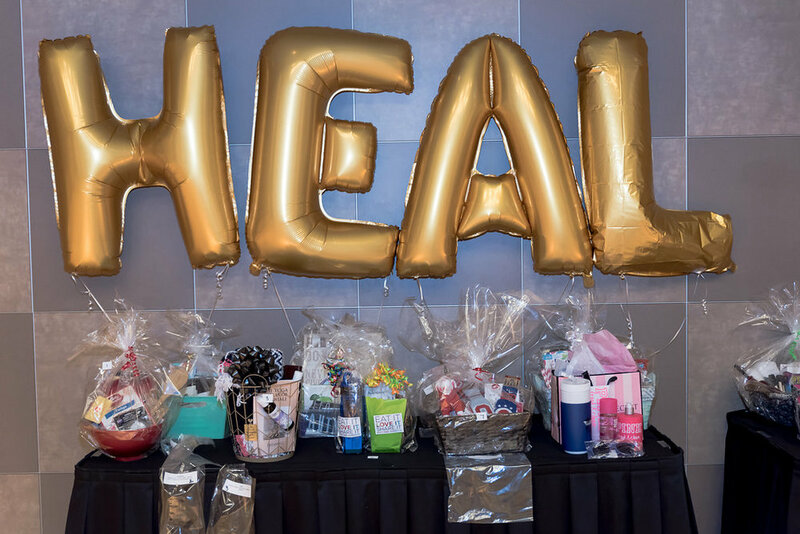 Chaired by Silicon Valley's Amanda Crew, the Project HEAL Southern California Chapter’s Fourth Annual Gala will take place on September 7th from 7:00 PM-10:00 PM in Los Angeles, CA. This year our gala will feature dinner and cocktails, a robust silent auction, a balloon pop with fantastic prizes, and special remarks from local celebrities and advocates. The theme of the event is "Resilience" highlighting the incredible strength and power it takes to fully recover from an eating disorder. We will be honoring Jenni Schaefer, Eating Disorder Advocate and Author of Life without ED: How One Woman Declared Independence from Her Eating Disorder and How You Can Too and Goodbye ED, Hello Me: Recover from your Eating Disorder and Fall in Love with Life. For more information about this event, including tickets and sponsorship packages, please visit the full event page here. This gentle practice focuses on fostering mindfulness, increasing quality of life, and lowering symptoms of depression, anxiety, and PTSD. Led by yoga instructor Sarah Hoffman, this class includes conscious breathing, physical movement, and guided relaxation. It will be accessible to all, regardless of physical limitations, fitness, or yoga experience. This is a class hosted by Zencare and Project HEAL. Zencare.co is a website to find vetted talk therapists in Boston. Individuals can check insurance and availability, browse videos of therapists, and book a free initial call to find a great fit. To get matched with a therapist, visit www.zencare.co or email hello@zencare.co. Project HEAL is a non-profit that provides access to HEALing for all people with eating disorders. Click here for more information and/or to purchase your tickets. IMPORTANT NOTE: There are limited spots available to attend this training. To express interest in participating, please complete the Body Project Facilitator Application by 07/23/2018. Facilitators who complete this training will facilitate this program to teens throughout Essex County, MA . during the 2018/2019 school year. Boston Chapter: Shop for a Cause! Join Project HEAL's Boston Chapter Ambassador, Brenna Briggs, along with members of the Chapter for a fantastic event on Thursday, July 19 from 6:00 PM to 7:30 PM featuring shopping, light refreshments, and an evening of inspiration. Those who can't join in person can still support Project HEAL-Boston Chapter by making an online purchase during the event time. Please join the Project HEAL-Denver Chapter at their first annual Nourish to Flourish Brunch on July 1st at The Lumber Baron Inn and Gardens! Proceeds raised at this event fund treatment financing and assistance for people suffering from eating disorders. This event will feature a delicious brunch buffet, live music from Sky Pond and an inspirational talk by Kelly Elise Ulmer, LPC, LMHC licensed mental health counselor and intuitive eating disorder counselor! Come dressed in your Sunday brunch attire and join us for this exciting event! For more information about the event, including to purchase tickets and/or sponsor packages, please click here. Join us for our Summer Learning Series where we will invite three clinicians over the span of three months to talk about their personal experience with eating disorders and recovery. Many clinicians (physicians, therapists, dietitians) who choose to work in the eating disorder field are also recovered themselves -- come learn how to they deal with day-to-day triggers in the context of recovery. We will kick off our series with eating disorder dietitian, Ashley Lytwyn, MS, RDN (Instagram: @nutritionunveiled), who will be discussing her personal experience with being a clinician who is also in recovery. Join us on June 16th, 10:00am-12:00pm at the Slate Apartments Great Room. Street parking available. Take elevator to the second floor. Light breakfast, coffee, and mimosas will be provided. For more information and to purchase your ticket(s) please click here. Join the Project HEAL- Boston Chapter for our third annual gala, Nourish To Flourish. The annual gala is our flagship event, with people coming together to celebrate recovery from across New England. Nourish To Flourish will feature remarks from our co founders and local advocate champions, a grand silent auction, passed hors d'oeuvres & desserts, and cocktails.